The first of our series of RAF 100 posts kicks off with the Gloster Meteor, pictured below with the famous Martin-Baker Meteor test aircraft. The Meteor was fitted with both Mk. 1E and Mk. 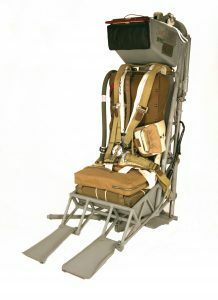 2E Martin-Baker Ejection Seats responsible for saving the lives of 41 RAF pilots ejecting from a Gloster Meteor. 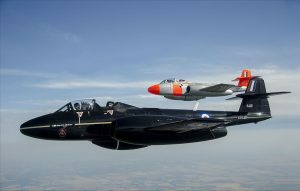 Although no longer in service in the RAF, the Martin-Baker Meteors are still used today to carry out live ejection tests on all new production seats. "I ejected at ~24,000 feet from my Mirage IIIc with a Martin-Baker JM6 seat, after a mid-air collision at a closing speed of Mach 2.4. The collision had severed my left wing and engine and I was free-falling to earth in the cockpit and right wing, which was on fire. I pulled the lower lever and ejected but fainted after my vertebrae crushed (I was slumped forward at ignition which, although unavoidable, was a bad idea)...."